So in Boston, one should always to be on the lookout for the choicest seafood. And we found it in the most unusual place. Cod, haddock, hake, scrod [had it once with soup d’jour, both were great], you can find those almost anywhere — except the ubiquitous Dunkin Donuts. In truth, I thought nothing could beat the “Sacred Cod” in Boston. I don’t mean the white fish that used to be the cause of wars in the North Atlantic. That is for the stomach. Lillian and I were looking out for the soul [note sole]. I mean the large carved descendant that was marched in the late 18th century from the Old State House by platoons of now Federalist legislators who also were bearing Governor Bradford’s papers on the Pilgrims to their new anti-Republican digs in Gov. John “The Smuggler with Good Handwriting” Hancock’s old garden. Yep, the members of the General Court might have cut through the Commons shooing the cows, sheep, goats and whatever else was grazing out of the way or possibly used the at-the-time convenient but steeper gravel path to reach the summit of Beacon Hill. But no matter how they got there, as they gazed heavenward, before them was financially-ruined Charles Bulfinch’s creation. The building stood there — sans the gold gild of a later day or even the copper shielding that the rock star of midnight riders Paul Revere would add to keep the wooden dome from weathering — in New England simple style with all its hold the line on spending. [There were more than a few hints here and there inside and out of Old England’s Christopher Wren] but still a breath to behold. But Lillian and I [actually more me] were on the lookout for a more elusive seafood this spring day, a species that we had been alerted to by potential guides at the information desk waiting for busloads or school kids or seniors to lead through the State House. 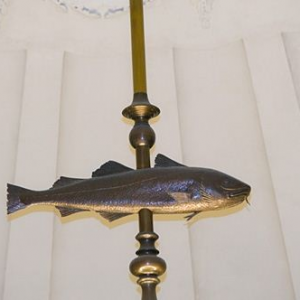 In the ocean, there are a number of species in the family mackerel; but in the Massachusetts State House, there is but one — not species, but one representation placed in the ascendancy of the Senate chambers. It appears to be spiked. The quest for the rarest of seafood choices had ended. In a few minutes, we were walking down Beacon toward Trinity Chapel and the Parker House, the home of “Scrod,” which very easily could mean “special catch run of the day” or the first white fish on the top of the day’s catch. Time to get ready for dinner.